Grey-Squirrel.org.uk - Professor Acorn's We're as native as you! Conservationists among you have somehow persuaded your government that we are "aliens", in part due to the gullibility and ignorance of your politicians, but as much to do with their desire to control nature. It also bodes them well if they can persuade your government to act on their advice and then be paid to carry out the solutions. Not only is this a truly vicious circle of killing from our point of view; it's a very lucrative one for them. Around forty-five generations ago some of our ancestors were captured by humans in North America, brought to the British Isles and later released. So conservationists believe, as we did not arrive here "naturally", we are an "alien species". That is the nub of the argument. But it is totally flawed! The conservationists' argument only stacks up if you take the view that humans are not part of nature. This is a ridiculous stance, as everybody knows you have evolved just like all other existing species over millennia and that your behaviour is a product of your own evolution, which in turn has been influenced by the interactivity between all species. Once you accept the inevitable, that you are part of nature, your desire to bring us to the British Isles must be considered a natural act and part of the interactivity that exists between species. From thereon the conservationists' position can be seen to be a fallacious and concocted agenda based on their desire to control and change the course of nature. We know of no alien or non-native species on planet Earth. I might add that your evolutionary progress could be the trigger to climate change that destroys us all. 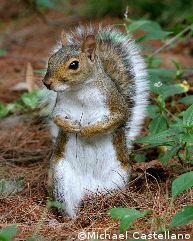 You have a lot more to worry about than grey squirrels.